If one were to walk around Bicentennial Hall, one could see strange contraptions, ranging from one foot high to three feet all, behind glass that appear to be large discs with mallets attached. Could these bizarre items be unusual clocks? Perhaps they were used in auditory demonstrations. After all, couldn’t the mallets bang on the disc as a musical instrument? No, the purpose of these machines was not to create sound, but electrical charge. 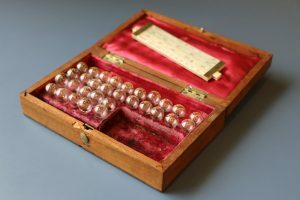 A device such as this is known as a Wimshurst machine. Invented in the 1880s by James Wimshurst, they belong to class of machines called electrostatic generators. 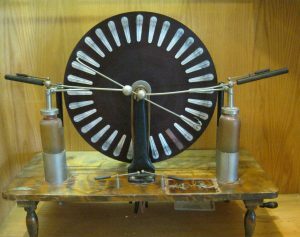 Unlike other apparatus that create an electrostatic spark, a Wimshurst machine does so using induction rather than friction. The two insulated discs rotate around, often by a mechanical crank, passing by neutralizer bars and brushes. Charges are induced onto the discs and collected onto the combs near the surface of the discs. The charges increase exponentially until the dielectric breakdown voltage of air is reached. When this occurs, a spark is created. The jars are Leyden jars, an early type of capacitor, and act to increase the accumulated charge. This machine, although able to show the effects of electrostatic charges, can be put to other uses. 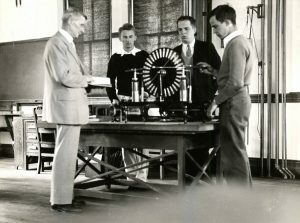 Professor Ernest C. Bryrant demonstrating how to operate this Wimshurst machine to students in a physics lab (c.1934). 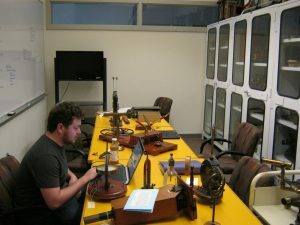 By connecting it with a chain to an electrostatic orrery, such as that in the 5th floor display of BiHall, one can observe the charges actually turning the orrery. 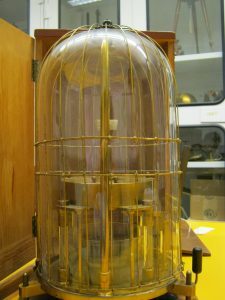 Indeed, there are quite a few electrostatic machines that are within the Middlebury Antique Science Collections that could be connected to a Wimshurst machine for amusing and educational demonstrations. Wimshurst machines at Middlebury College can be found on the 5th floor of BiHall and in Armstrong Library. This entry was posted in LIS Staff Interest and tagged antique instrument collection, Armstrong on August 4, 2017 by Wendy Shook. The Libraries will have reduced hours this weekend for Fall break. Davis will close at 8 pm on Friday and be open 9-5 Saturday, Sunday, and Monday. On Tuesday, we will open at 9 am and close at the regular 1 am. Armstrong will close at 5 pm on Friday and be closed Saturday and Sunday. Hours Monday will be 9-5 and Tuesday will be 9-midnight. Regular hours resume on Wednesday. See go/hours for the full calendar. This entry was posted in libitsblog, Library, libspotlight, lisblog, Middlebury Community Interest, middpoints, Post for MiddNotes, Post for MiddPoints and tagged Armstrong, armstrong library, borrowing, circulation, Circulation Services, hours, hours of service, library hours on October 7, 2014 by Dan Frostman. Calculators: These have a four hour loan rule and may be taken outside of the Library. Mac VGA Adapters: These are found in the same drawer as the calculators and have a 4 hour loan rule. These are typically checked out with LCD projectors and may be taken out of the Library. This entry was posted in Uncategorized and tagged Armstrong, armstrong library, borrowing, Did you know?, equipment, User Services on March 1, 2011 by Shawn O'Neil. New Delivery Options for NExpress and ILL: Armstrong Library Pick up. We have made the Armstrong Science library an official pick up location for ILL and NExpress materials. If you select Armstrong delivery, your requested materials will be automatically sent to the Armstrong Science Library for pick up when they arrive at Middlebury. This is now possible for both NExpress and interlibrary loan materials. However, selecting this option is done very differently in each system. Please contact mdyill@middlebury.edu with any questions. This entry was posted in LIS Staff Interest and tagged Armstrong, armstrong library, Collection Management, ILL, Library Spotlight, Middlebury, NExpress, Research & Collection Services, service changes, User Services on August 3, 2010 by Rachel Manning.